It’s never to late to start baking Christmas cookies, and they certainly never go to waste. Who doesn’t love cookies at Christmas time? Whatever hasn’t been eaten or given away can be frozen for a possible future gift, hostess gift, or a plateful to share at the office. I love cookies that are not too big or filling, easy to pick up and eat, and aren’t messy. Cookies in sticks or slices are usually just a few bites and go great for an afternoon pick-me-up with a cup of coffee, tea, or hot chocolate. 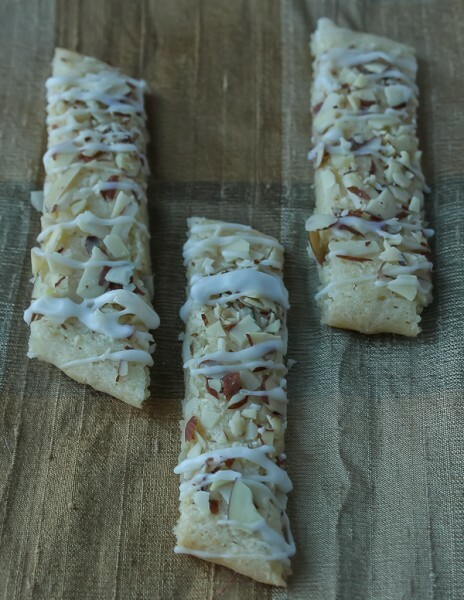 These almond stick cookies meet all that criteria, plus they are not difficult to make and look very festive. A simple dough with just the right amount of almond extract is divided into logs. The logs are baked, sliced while warm, then drizzled with an almond icing. They freeze well too. The recipe makes 4 dozen, plenty for a cookie exchange or 4 gifts of a dozen cookies each. Nothing says love at Christmas like something homemade. Stir together flour, baking powder, and salt; set aside. In large bowl of electric mixer beat butter about 30 seconds until creamy, then add sugar and beat until well combined. Add egg and ½ teaspoon almond extract; beat well. Add flour mixture and beat until well mixed. Divide dough into 4 equal portions. Wrap each in plastic wrap or wax paper and chill until firm enough to roll into long ropes. Heat oven to 325 degrees. Line 2 cookie sheets with parchment paper if desired, or leave ungreased. Roll each portion of dough into a 12-inch long rope and place 2 on each cookie sheet about 4 to 5 inches apart. Using your hands, flatten each roll until it is about 3 inches wide. Doing one flattened rope at a time, brush lightly with milk and sprinkle with some almonds. Repeat with all 4 ropes. Bake for 12-15 minutes or until the edges are lightly browned. While cookies are still warm and soft on the cookie sheet, cut them crosswise at a diagonal into 1-inch wide strips. Remove sliced cookies to wire racks to cool. When cooled, drizzle each with almond icing and let sit until icing is set. To make almond icing, stir together sifted powdered sugar, almond extract, and enough milk (about 3-4 teaspoons) to make an icing of drizzling consistency. Yum! I have printed your recipe and plan to get busy in the kitchen this morning! 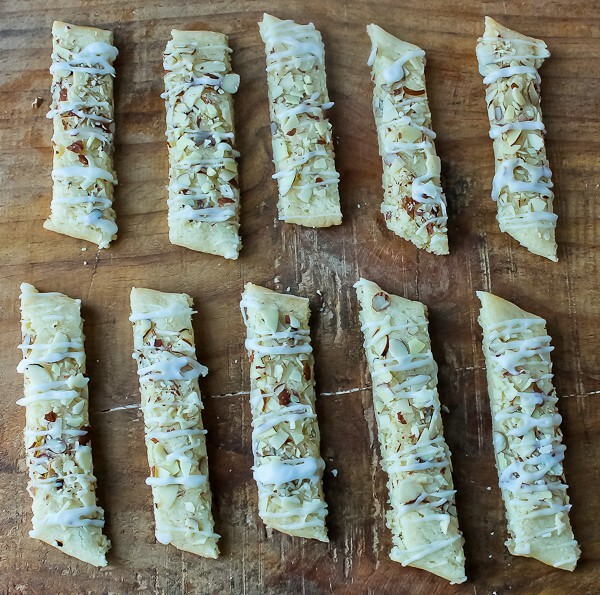 I have a favorite Almond Biscotti recipe from Cooking Light that we all enjoy with a cup of coffee but for Christmas these sound extra delightful with that added buttery flavor. And so simple, I can easily share some with our neighbors! Thanks and a very Merry Blessed Christmas. Have made these many times. They are unbelievably easy ! They look elegant and taste wonderful ! There are never any left because everyone loves them. I was devastated when I misplaced my recipe. I am thrilled and excited to have found it again thanks to your website. Thank you, thank you, thank you ! You are so welcome, Phyllis! I’m thrilled that I happened to have a beloved recipe that you misplaced. I love these too. Please come back and see me again!